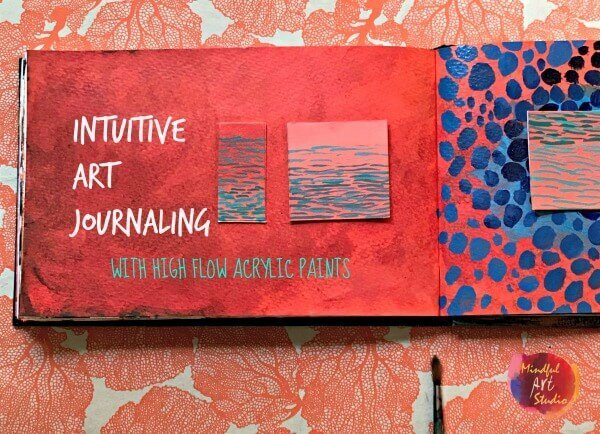 I’ve been having the most wonderful spring, spending time with my students in the Diving Deep intuitive art journaling class. As often happens, I’m learning almost just as much as the students as I teach. I’m so excited to be able to share some of the Diving Deep process with you. 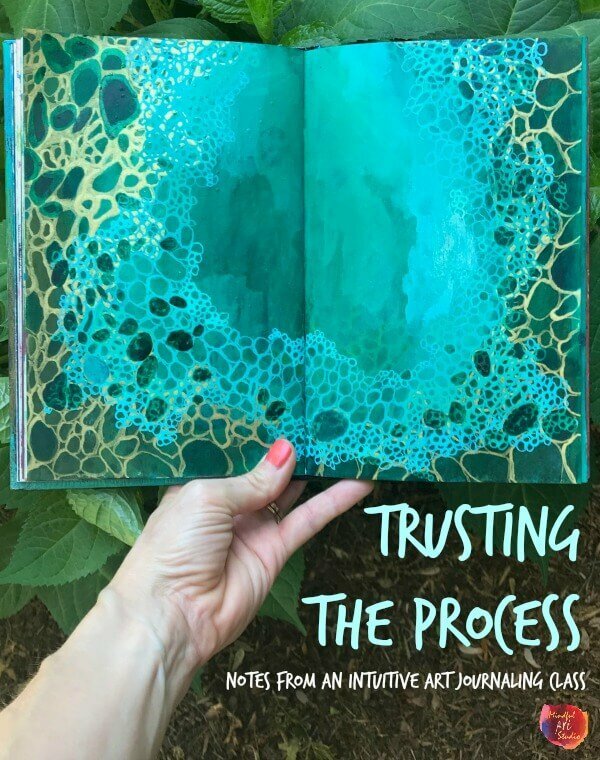 Trusting the process is a big piece of the puzzle in intuitive painting, so I’d love to share with you about what that means for me, and show you how many transformations it sometimes takes before a page reaches its final iteration. 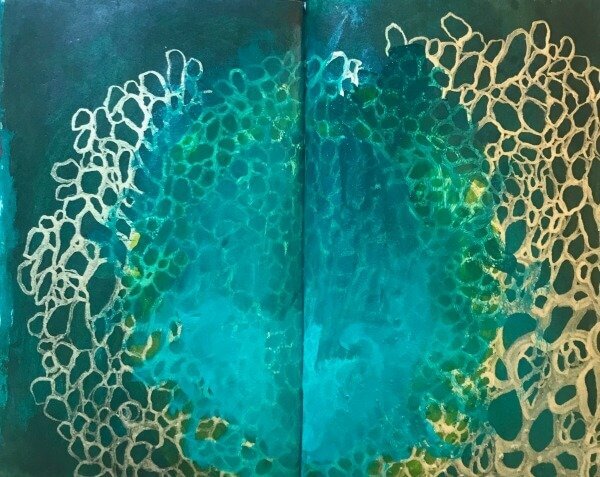 This piece started as an abstract watercolor page with pinholes. 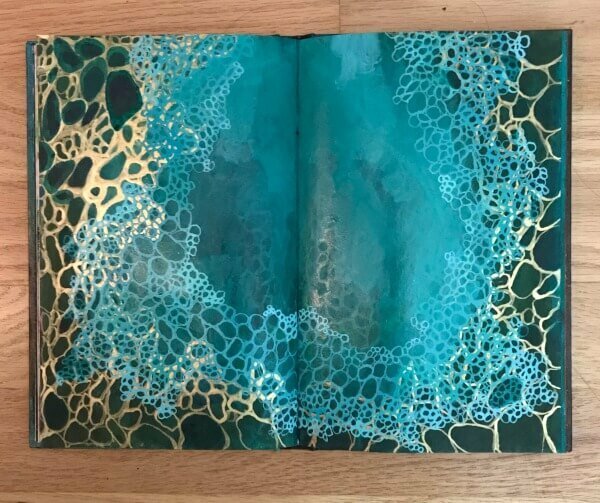 I didn’t ultimately feel the page had reached its potential, and it’s in the Strathmore watercolor journal I like a lot, so I decided to use it to do a smoky background. I was quite pleased with the result, especially the light. However, I did not care for the mark on the left page, so this spread was a good candidate for further work. Getting started can sometimes be hard. Where to start? This is a place where a lot of people get hung up, and never get started. I work on backgrounds all the time so that I always have something to start with. 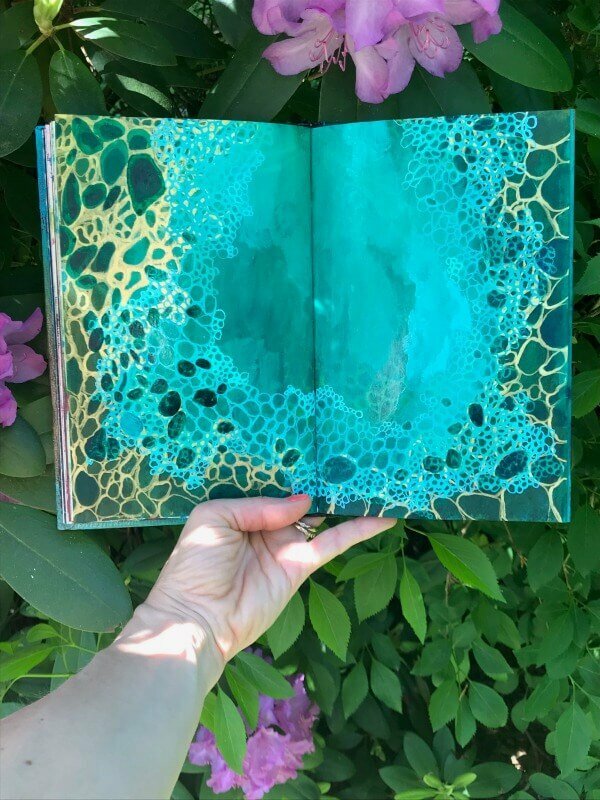 I like to look at pictures I’ve collected and works in my own journals for inspiration. Starting with a background such as this one, and an inspiration photo or two helps give me a starting point. 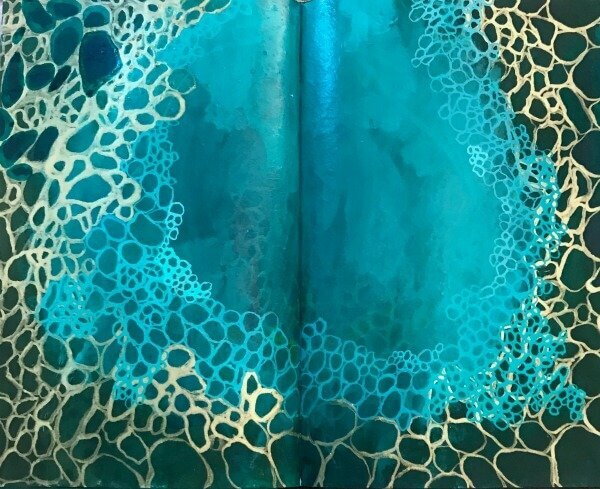 After looking at the mysterious, green background, and many ocean themed and pattern driven inspiration photos, I had a sense of wanting to paint cellular shapes in gold. 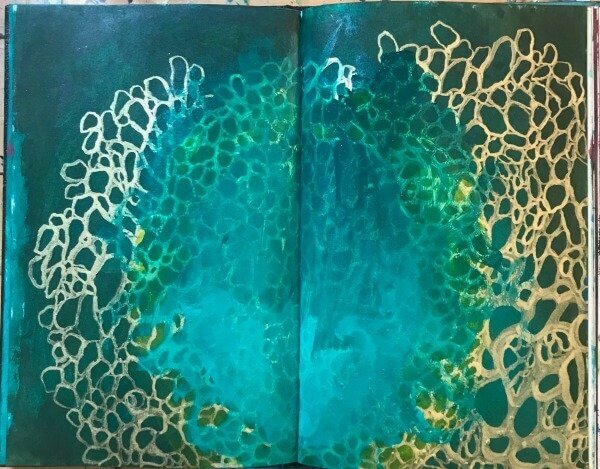 Soon I added a circle of yellow, but I soon covered in teal, and started to really enjoy the colors that were developing before me. Something seemed to be emerging near the bottom, and I thought it was some sort of nest or cocoon. I added something that I thought might be eggs or berries, but they soon disappeared. Can you see how I let the process lead me rather than trying to be so in control of it? I try not to force anything too much. 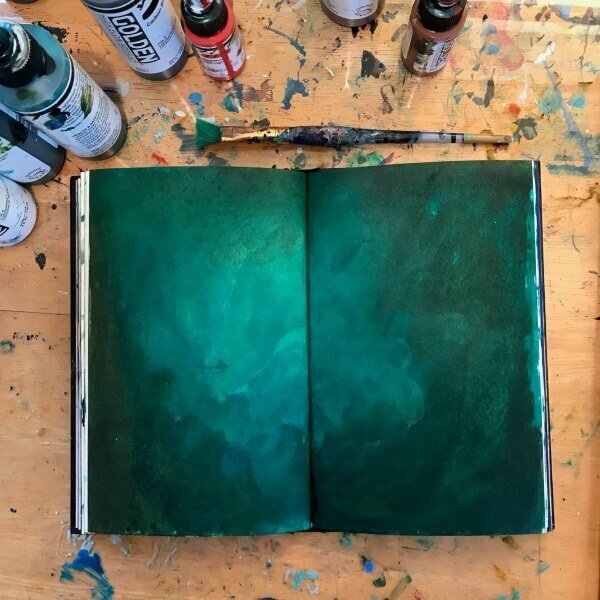 That beautiful green background was practically gone, but if I was going to work intuitively and trust the process, I had to be willing to let it go. I wasn’t sure what I was seeing or where the piece was going. I think this not knowing stage is a place where a lot of people give into the anxiety of the unknown and give up. Sometimes they put the work away all together, and other times they settle for something trite and safe. There’s nothing wrong with that if it fills your soul. But if you are looking to dive into the depths of your inner landscapes, I find it usually takes a willingness to dig deeper. 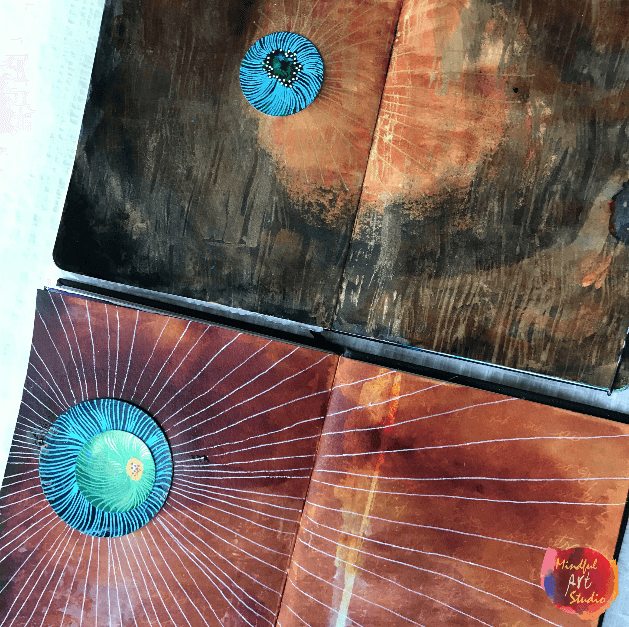 Sitting with the anxiety of the unknown in our art has deep parallels to our lives. Not everything we feel is pretty. Not everything we experience happens on a liner path. Not all the outcomes are clear from day one. We can’t possibly know what’s going to happen, so we have to walk through our lives with a certain amount of faith in the process of putting one foot in front of the other. To do that, we all have routines that help organize our lives. We trust our routines, they make us feel safer. It is the same with our art. My art routines help me tolerate the uncomfortableness of not knowing if my efforts will result in a piece I don’t like. 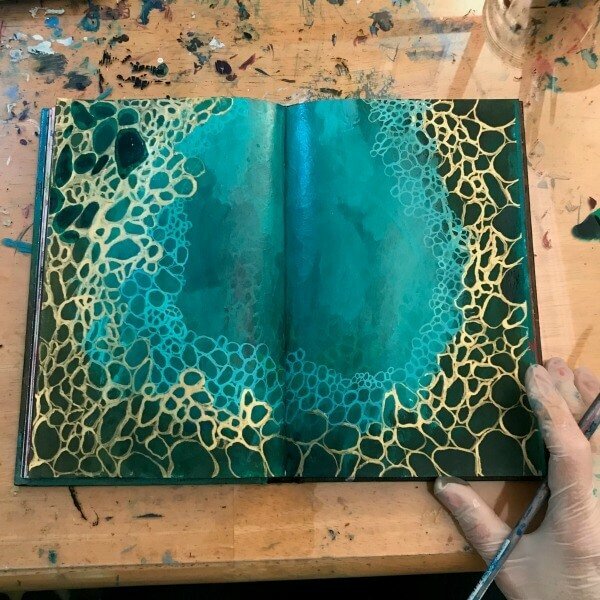 I think part of why the Diving Deep class is so powerful is that within an intimate, supportive group, artists have the chance to experiment with techniques, but also find the habits that help them trust the process and translate their intuitive voice onto the page. After a lot of back and forth, looking, listening, and waiting, I ultimately realized that this piece was all about the enjoyment and celebration of color. This became a guiding force in each decision I made moving forward. And despite this realization, I did get stuck again, but each time it happened, when I sat back, I’d return to looking, waiting, and listening, and the art reminded me of where I was going. It’s funny how we need so many reminders about what matters, isn’t it? And with our art, it’s the same. It’s the process that matters. Art is about you taking time to listen deeply to yourself and the world around you. It’s about an exploration of what is, in all it’s color and depth. Is IS all about the color. And the diving in. 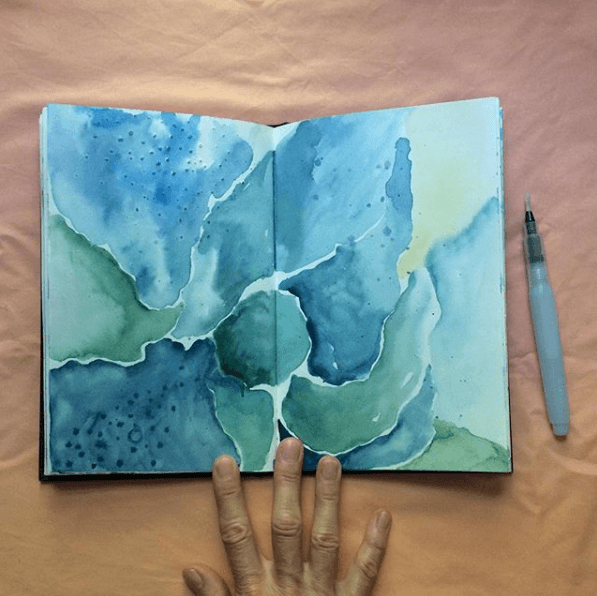 I hope you dive into your journal today. You can get some help getting started here. *The links provided in this post are affiliate links. 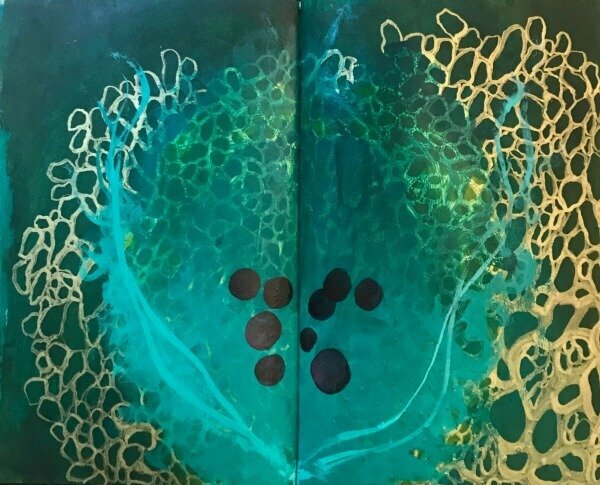 That means, at no extra cost to you, if you decide to click the link and purchase something, a small fee will go towards the work of Mindful Art Studio to empower the artist in all of us. Thank you!